A range of professional headsets to enhance productivity in the open office. Jabra GN9350e wireless headset works with your desk and softphone providing hands-free mobility. Jabra GN9350e OC wireless headset works with your desk and your softphone to provide hands-free mobility and is optimized for Microsoft Office Communicator (OC). The Jabra GN9330e USB wireless headset gives you extra freedom of movement for all your PC-based conversations. Newly designed, the Jabra GN9330e wireless headset frees you from your desk. Now go farther and do more with its expanded wireless range of up to 325 feet! 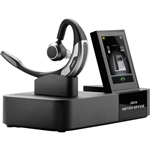 Jabra LINK 180 is a manual switch that enables users to answer calls from both desk phones and PC (softphones) using the same headset. Add the Jabra GN1000 Remote Handset Lifter to your Jabra wireless headset system and you can remotely answer and end calls. The GN8000 multi-purpose amplifier connects a headset to virtually any phone. It enhances the quality of calls by reducing background noise and providing a consistent volume level for calls. It also provides advanced hearing protection and a switch to easily direct your calls. Jabra PRO 920 connects to a desk phone and has all the essential features of a wireless headset at a great price. This Jabra PRO 930 connects to a PC (softphone) and is optimized for Microsoft Lync and Microsoft Office Communicator. Jabra PRO 930 UC connects to a PC (softphone) and has all the essential features of a wireless headset at a great price. With Jabra PRO 9470 calls from your desk, mobile or softphone can come to the same headset. Jabra PRO 9460 Duo allows office staff to answer either of their phones, even if away from their desk. With Jabra PRO 9465 calls from your desk, mobile or softphone can come to the same headset. The Jabra Motion Office Headset you can use both at work and on the go. Nano-sized USB adaptor helps you easily connect to a PC. Find the best fit with a selection of eargels. Get best-in-class wireless range of up to 100 meters (300 ft). The Jabra PRO 9450 is ideal for companies transitioning to Unified Communications. It is UC ready with dual connectivity, desk phones and UC softphones, and is compatible with all leading brands of desk phones and Unified Communications applications. The Jabra PRO 9450 is ideal for companies transitioning to Unified Communications. It is UC ready with dual connectivity, desk phones and UC softphones, and is compatible with all leading brands of desk phones and Unified Communications applications. The Jabra PRO 9450 is ideal for companies transitioning to Unified Communications. It is UC ready with dual connectivity, desk phones and UC softphones, and is compatible with all leading brands of desk phones and Unified Communications applications. The Jabra PRO 9450 is ideal for companies transitioning to Unified Communications. It is UC ready with dual connectivity, desk phones and UC softphones, and is compatible with all leading brands of desk phones and Unified Communications applications. Jabra PRO 9460 allows office staff to answer either of their phones, even if away from their desk. The GN2120 headset’s 3-in-1 design lets users choose the most comfortable wearing style. The GN2124 headset provides four different wearing styles: our popular lightweight headband, the adjustable FlexLoop, the SureFit earhook, or the new neckband option. The Jabra GN2000 USB OC mono-speaker headset allows users to experience the true wideband sound of Microsoft® Office Communicator 2007--with hands-free advantages and completely plug-and-play. The Jabra GN2000 USB OC duo-speaker headset allows users to experience the true wideband sound of Microsoft® Office Communicator 2007--with hands-free advantages and completely plug-and-play. GN Netcom 2.5 mm adapter cable Connects GN Netcom Headsets to any 2.5mm headset jack as well as a variety of cellular and cordless telephones. The GN 8000 AC Adapter is a power supply for the GN 8000 Headset Amplifier, eliminating the need for batteries. The Jabra GN1200 cord is the solution to the common problem of not being able to connect your headset and telephone. 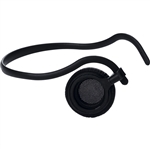 Jabra PRO 9400 & PRO 900 Neckband (14121-24) Jabra PRO 9400 Series Battery Replacement Kit (14192-00) The Cisco HHC enables EHS functionality to work with Cisco 7900G phones manufactured after Sept. 2007 and Jabra GN9350, GN9120 EHS and GN9120 Duo EHS wireless headsets. Jabra wireless headsets with electronic hook switch functionality (EHS) allow you to remotely answer and end calls. Jabra wireless headsets with electronic hook switch functionality (EHS) allow you to remotely answer and end calls. Jabra wireless headsets with electronic hook switch functionality (EHS) allow you to remotely answer and end calls. Jabra wireless headsets with electronic hook switch functionality (EHS) allow you to remotely answer and end calls. This Jabra UC VOICE 150 is a corded, mono-speaker headset designed specifically for Microsoft® Lync 2010 and Microsoft® Office Communicator and for the occasional user in both small and large office environments. The Jabra UC VOICE 150 is a corded, mono-speaker headset designed specifically for Unified Communications deployments and for the occasional user in both small and large office environments. This Jabra UC VOICE 150 is a corded, duo-speaker headset designed specifically for Microsoft® Lync 2010 and Microsoft® Office Communicator and for the occasional user in both small and large office environments. This Jabra UC VOICE 150 is a corded, duo-speaker headset designed specifically for Unified Communications deployments and for the occasional user in both small and large office environments. The perfect complement to your VXi V200, V150 or V100 Wireless Headset System! With the L50 Remote Handset Lifter, you can pick up and hang up calls anywhere your office wireless takes you—with the push of a button. This is the VXi VEHS-A1 EHS stand for Avaya 1600, 9600 phones. It gives VXi wireless headsets remote answering capabilities. Compatible with all VXi wireless headsets. Attaches directly to the base of the VXI wireless headset base with clearly labeled jacks and cables. Not compatible with Avaya 9601 and 9610. This is the VXi VEHS-P1 EHS stand for Polycom IP phones (335, 430,l 450, 550, 560, 650, 670, and all Polycom VVX models). It gives VXi wireless headsets remote answering capabilities. Compatible with VXi wireless headsets. Attaches directly to the base of the VXI wireless headset base with clearly labeled jacks and cables. This is the VXi VEHS-S1 EHS stand for Snom 300, 700, and 800 Series desk phones. It gives VXi wireless headsets remote answering capabilities. Compatible with all VXi wireless headset models. Attaches directly to the base of the VXI wireless headset base with clearly labeled jacks and cables. This is the VXi VEHS-C1 EHS stand for Cisco 7900 series IP phones (Models 7942, 7945, 7962, 7965 and 7975). It gives VXi wireless headsets remote answering capabilities. Compatible with all VXi wireless headsets. Attaches directly to the base of the VXI wireless headset base with clearly labeled jacks and cables. Meet VXi’s V-Series Office Wireless Headset Systems. With options spanning from single- to tri-connectivity you can stay connected and enjoy the best value in office wireless. Meet VXi’s V-Series Office Wireless Headset Systems. With options spanning from single- to tri-connectivity you can stay connected and enjoy the best value in office wireless. Meet VXi’s V-Series Office Wireless Headset Systems. With options spanning from single- to tri-connectivity you can stay connected and enjoy the best value in office wireless. Meet VXi’s V-Series Office Wireless Headset Systems. With options spanning from single- to tri-connectivity you can stay connected and enjoy the best value in office wireless. Meet VXi’s V-Series Office Wireless Headset Systems. With options spanning from single- to tri-connectivity you can stay connected and enjoy the best value in office wireless. The Jabra LINK 220 USB Adapter enables plug-and-play connectivity with corded Jabra headsets and PC based audio/voice applications. This makes it the ideal solution for contact centers that want a smooth and cost-effective transition to IP telephony. The Jabra LINK 230 USB Adapter enables plug-and-play connectivity with corded Jabra headsets and PC based audio/voice applications. This makes it the ideal solution for contact centers that want a smooth and cost-effective transition to IP telephony. The Jabra BIZ 2420 headset is a mono-speaker headset with improved noise-canceling features for business and contact center professionals using standard desk phones. The Jabra BIZ 2425 is a duo-speaker headset with improved noise-canceling features for business and contact center professionals using standard desk phones. The Jabra BIZ 2400 II is a duo-speaker headset with improved noise-canceling features for business and contact center professionals using standard desk phones. The Jabra BIZ 2400 USB headset is configured for PC-based IP telephony and delivers pure Hi-Fi audio quality with multimedia applications. The Jabra BIZ 2400 USB headset is configured for PC-based IP telephony and delivers pure Hi-Fi audio quality with multimedia applications. This Jabra UC VOICE 250 is a corded, portable, mono-speaker headset designed specifically for Microsoft® Lync 2010 and Microsoft® Office Communicator. This headset is easy to transport and perfect for professionals who work in different locations during the day – both inside and outside the office. This Jabra UC VOICE 250 is a corded, portable, mono-speaker headset designed specifically for Unified Communications deployments. This headset is easy to transport and perfect for professionals who work in different locations during the day – both inside and outside the office. The Jabra LINK 280 USB Adapter enables PC connectivity and full softphone integration with GN Netcom’s Quick Disconnect (QD) headsets. The combination of user-defined call controls and Multiuse connectivity makes it perfect for businesses that want a cost-effective and flexible transition to Unified Communications. Jabra GO™ 660 connects wirelessly to your Bluetooth® mobile phone and simultaneously to your personal computer via the enclosed Jabra LINK™ 320 USB Bluetooth® adapter. So now you only need one headset for mobile phone calls, PC based telephony, internet radio, music streaming etc. This Jabra UC VOICE 550 is a corded, mono-speaker headset designed specifically for Microsoft® Lync 2010 and Microsoft® Office Communicator. The headset is made for desk-centric professionals who occasionally work from different locations and need to take the headset with them. This Jabra UC VOICE 550 is a corded, mono-speaker headset designed specifically for Unified Communications deployments. The headset is made for desk-centric professionals who occasionally work from different locations and need to take the headset with them. This Jabra UC VOICE 550 is a corded, duo-speaker headset designed specifically for Microsoft® Lync 2010 and Microsoft® Office Communicator. The headset is made for desk-centric professionals who occasionally work from different locations and need to take the headset with them. This Jabra UC VOICE 550 is a corded, duo-speaker headset designed specifically for Unified Communications deployments. The headset is made for desk-centric professionals who occasionally work from different locations and need to take the headset with them. The Jabra GO 6430 makes your mobile office complete by providing a full-featured Bluetooth® solution that unites your mobile and laptop-based voice channels. Jabra GO 6470 lets you be hands-free on any phone you use be it mobile, desk or softphone. The Jabra Motion UC makes your mobile office complete by providing a full-featured Bluetooth® solution that unites your mobile and laptop-based voice channels. Jabra Motion Office UC lets you be hands-free on any phone you use be it mobile, desk or softphone. Whether you want to go completely wireless or just hands-free, Jabra / GN Netcom has a headset to suit your needs. To be completely mobile in or out of the office, check out Jabra GO 6430 or 6470. Jabra PRO 9460 and 9470 wireless headsets are perfect for complete mobility in the office. The Jabra 9300e series wireless headsets work with both traditional phones and PC-based phones (softphones) and with the various options available on both the 9330e and 9350e, you're sure to find just what you need and want. For traditional phones, the Jabra GN9125 series wireless headsets offer an unbeatable range of personal mobility. Check out the Jabra BIZ 2400 series or the GN2000 series for corded headsets that work with both desk phones and softphones and come in mono or duo speaker versions. For traditional desk phones, check out the award-winning Jabra GN2100 series of corded headsets with different wearing options such as the lightweight headband, the adjustable FlexLoop, the SureFit earhook, or the new neckband. Last but not least, the Jabra BIZ 620 headset is the ultimate entry-level headset for first time users of Unified Communications with its plug-and-play solution.